Eat Your City: Tony's Pizza Palace Edmonton, AB - tossing and serving fine extra thin crust pizzas since 1974! Tony's Pizza Palace Edmonton, AB - tossing and serving fine extra thin crust pizzas since 1974! 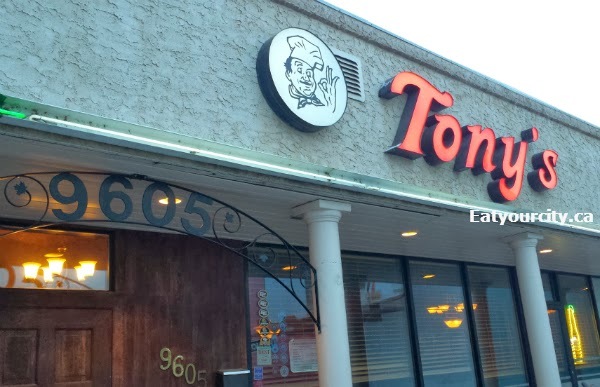 Some of my friends have been going and raving about Tony's Pizza Palace for years, and we finally got a chance to be in the area around dinner a little while ago, and yes, the taste of tradition is still alive and kicking at Tony's Pizza Palace! There's pizza dough spinning expertly up into the air, with the scent of garlic and cheese redolent in the air as you step into this pizzeria... its like taking a step back into the past when pizza was being born in Edmonton... they've been perfecting their pizzas since they opened in 1964? 1965? but... onto the food! They had a lot of different appetizers, but we went Tony's Italian Pretzel. 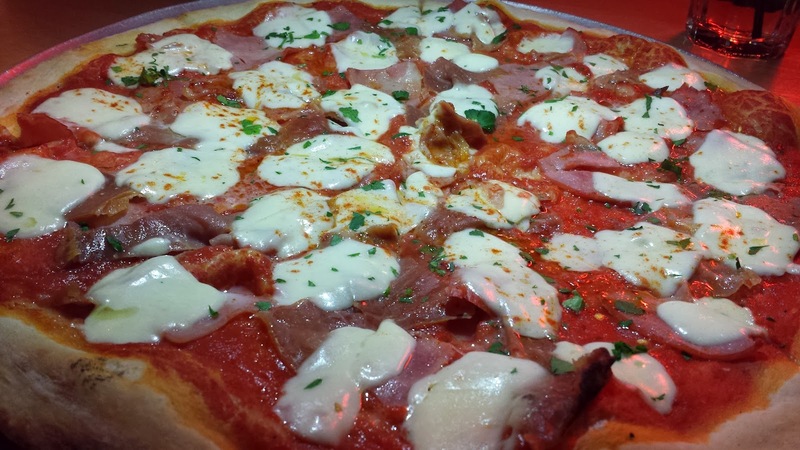 Its advertised as a twisted creation using our unique dough topped with anchovies, fresh garlic, virgin olive oil and special spices. Its huge and definitely an appetizer meant to be shared amongst many. The baked dough alternates between soft tender to slightly chewy crisp, with plenty of garlic salt, oregano and bits of anchovies add a nice punch of salty savory unami goodness. It was hard not to eat too much of it before the rest of our food came out! Since it was just the two of us, we over ordered so we could try more and have plenty of leftovers for lunch and snacks the next few days. There were some specialty pizzas that you have to pre-order at least 24 hours ahead (and are $40-50 each so it got us thinking what on earth is so special about them.. and of course, plunks it on our to try list when we return next time), so sadly we skipped over those and gave the menu an eyeball of the thin crust pizzas they're known for. Though the pizza menu states there's no substitutions, if you have allergies, they do accommodate (its not set in stone!). There's plenty of salads, pastas and more, but we zero'ed in on the pizza. First out was the Original New York Style or The Classic II. The pizza dough was tossed and spun almost up to the ceiling to the delight and squeals of some young kids who smushed their face up against a fmaily and kid friendly small viewing booth right beside where the pizza maestro's toss the pizza dough to make the pizzas. This extra large pizza (only size available for this menu selection) was topped with mozzarella and Tony's Special Spices - basil, oregano, garlic salt (I may be totally out to lunch since the spices are special and top secret!) and fresh flat leaf parsley to garnish. 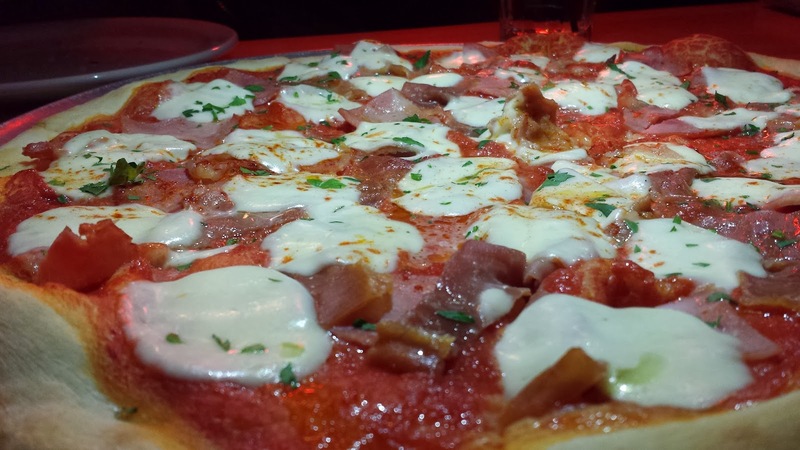 The thin crust was so thin it was nearly non-existent, crispy and was magically strong enough to hold up the entire extra large slice without flopping! The tomato sauce was a shade on the salty side, but if you have a salt craving, this simple savory pizza hits the spot. We also tried a large version of Sal's Deluxe. Again, the ooper thin crispy crust is fantastic and its covered in a sweet mellow tomato sauce, Prosciutto slices that were thick enough to be ham like, Capicollo and sweet marinated tomatoes and blobs of delectable melted soft young Bocconcini cheese and garnished with a good sprinkle of fresh flat leafed parsley... would have loved some fresh basil on this pizza, but we wanted to try their pizzas the way they've been making it for eons! And yes, both pizzas were totally awesome cold at home as well as piping hot out of the oven! 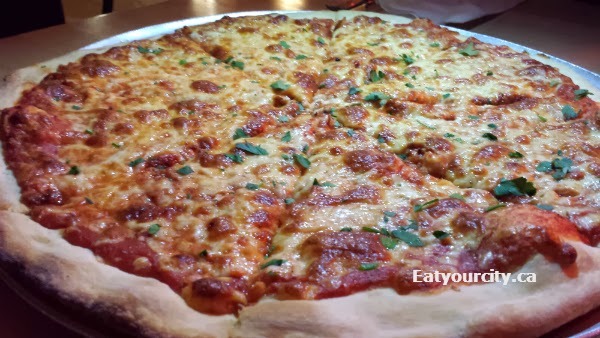 While I like the better quality ingredients on the thin crust pizza at Spinelli's Bar Italia west end more, Tony's Pizza Palace edges them out in the crust category... having a thinner crust that holds up the ingredients without drooping.. even when the pizza is cold. Feeling so divided.. you'll just have to taste them both for yourself to judge! 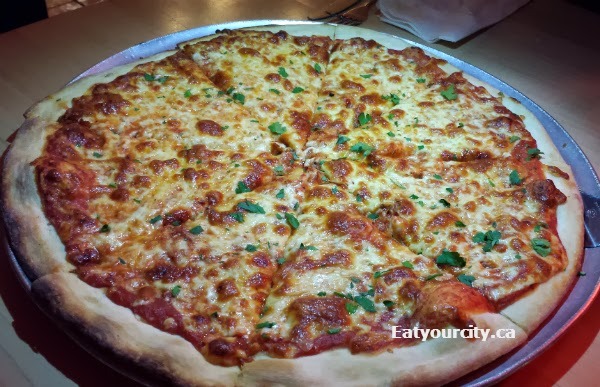 The tradition of great thin crust pizza lives on at Tony's Pizza Palace. Definitely will be back to try more of their insanely thin crust pizzas, the 24 hours in advance prep time pizzas, salads, pastas and entrees! And lug along the SLR.. I took these pics with my phone, at night, with my boyfriend's phone providing a half decent light source, under the glare of a red light outside a window lol, so the pics aren't super ideal... but this place is too tasty not to share!